Libera Community Space (Coffee, Books, & Infoshop) needs your help! Libera Community Space is organized by a group of anarchist-minded people in a horizontal and egalitarian way. We promote issues such as gender & sexual liberation, economic equality, and other socio-ecological issues, be it in forms of writings, arts, or social movement. We are openly egalitarian and not dogmatically ideological or religious. We are open for participation from all people, regardless of their backgrounds. However, we do not want to get involved with political parties, NGOs, or anything institutional. We are committed in making a true grass-root and self-organized community. If any of you friends are in Yogyakarta, our place can be easily found. You can just type “Libera Coffee and Book” on Google Maps. Of 6 individuals who are involved at Libera, we mainly work as freelance writers & translators, illustrators, and baristas. Most of us don’t have a college degree, but we have managed to allocate some of our personal income for the infoshop. I hope this short introduction can convince you to help us. Most and foremost, we need a bigger place. 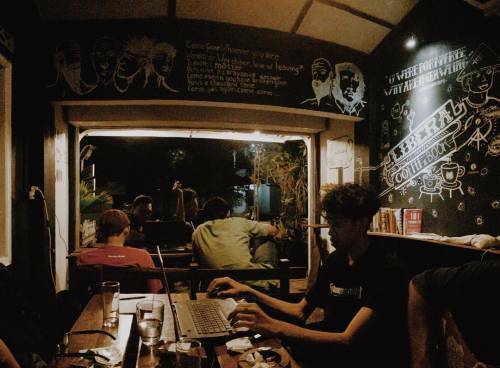 We hope, by having a bigger place, we would be able to have a collective house where travelling anarchists and activists can have a place to stay while they are in Yogyakarta. Our current place is too small for that. We also hope that at this new place, we would be able to do several other projects that we are not able to do at our current place due to its space limitation, such as establishing a bigger library, home gardening, self-defense classes, and other ideas that might come up once we already have the place. The estimated cost is about USD 1,800 . Therefore, we would like to invoke your solidarity, be it in forms of books, financial-aid, or a help in spreading the words. And if you’re in town, our token of gratitude will include an art print.